Chrysanthemums (Chrysanthemum morifolium) make it easy to punch up the color in your fall landscape. 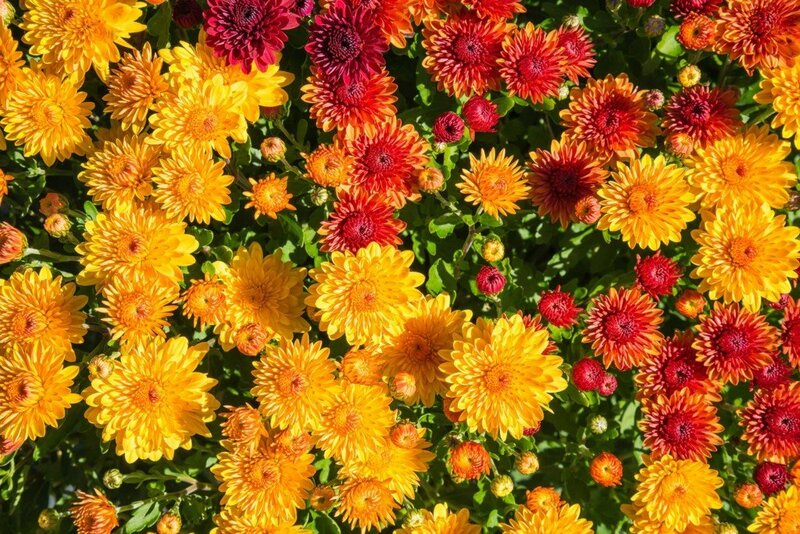 Generally known as mums, these easy perennials are available in garden centers this time of year in an array of colors and varying sizes. Some mums have a single flower form that resembles a daisy. Others have a more “pompon” or rounded look. Make sure you select “garden mums,” which tolerate cold better than “florist mums.” Choose a healthy plant that’s full of buds. Although they prefer full sun, mums will perform quite nicely with partial-day sun. Plant in a well-drained site, apply slow-release fertilizer and water well. Mums are especially striking if planted en masse. Or, plant mums in attractive containers to brighten a shady spot. If you have two pots, you can rotate them between shady and sunny sites for optimum health and appearance. In early- to mid-summer, pinch back the growing tips regularly to promote full, rounded growth. If the wet summer we’ve had produced a growth spurt for your mums that left you with leggy plants, don’t despair. Shear your mums into the rounded shape you want; these are tough plants, and they’ll rebound. Once a frost or freeze has knocked your mums back, don’t prune them, which sends a signal to start growing again. Instead, pick off the dead stems and flowers and mulch the crown of the plant well.